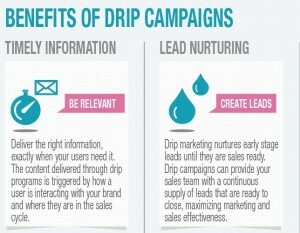 What is a DRIP mar­ket­ing cam­paign? Should I be DRIPPING? The image of a drip­ping sink can be unpleas­ant- drip, drip, drip. Most home­own­ers aim to stop the drip as soon as they can hire a plumber. But Mar­keters often embrace drips – drip mar­ket­ing cam­paigns that is. What is a drip mar­ket­ing cam­paign? A drip mar­ket­ing cam­paign has a sim­i­lar reg­u­lar­i­ty of a drip­ping sink, but when set up well it has the con­sis­tent mes­sag­ing that mar­keters love. In a drip mar­ket­ing cam­paign, you set up a reg­u­lar sched­ule of mes­sages that go out on a reg­u­lar basis to a spe­cif­ic audi­ence. The drip sched­ule is set by the mar­keter. Often it is orga­nized by time; for exam­ple, every week anoth­er cam­paign is sent. This drip can con­tin­ue for 2 weeks, 2 months or longer. The val­ue is that the cus­tomer is “touched” reg­u­lar­ly with time­ly info but with no incre­men­tal effort. It also can move a prospect through the sales fun­nel toward con­ver­sion. In addi­tion to using time to dri­ve the mes­sag­ing, mar­keters can use behav­iors or cus­tomer attrib­ut­es to drip spe­cif­ic mes­sages. These are called “trig­gered” cam­paigns. For exam­ple, if your cus­tomer has signed up but has not placed an order in 30 days, you can “drip” or “trig­ger” an email that high­lights the site’s order­ing capa­bil­i­ties and offers a lim­it­ed-time 20% coupon. Anoth­er good behav­ior-based trig­ger could be for a cus­tomer who has not logged in to the site in a spe­cif­ic time frame. You could email them a “see what’s new” email that includes a spe­cial gift. Com­merce site oper­a­tors have long known that aban­doned carts are the most pro­duc­tive drip or trig­gered cam­paigns you can send. Exam­ple of aban­doned cart email. A buy­er has shown inter­est in prod­ucts (by putting them in their cart) but did not “check out” those prod­ucts. Per­haps the buy­er decid­ed against them; but often the buy­er sim­ply got dis­tract­ed and for­got to check out. A trig­gered email that reminds the buy­er of this “aban­doned cart” will often result. Recap­ture rates can approach 30%. Check out this case study. How can I set up a drip or trig­gered cam­paign? Basic email mar­ket­ing sys­tems like Con­stant Con­tact offer basic drip cam­paigns. Trig­gered cam­paigns require access and, ide­al­ly, inte­gra­tion with your web­site or oth­er sys­tems. Par­dot, Mind Matrix, and Mar­ke­to are lead­ers in mar­ket­ing automa­tion sys­tems which fea­ture trig­gered emails. As April show­ers come this spring, be sure that your faucets are not the only thing drip­ping. Rather be sure your mar­ket­ing is drip­ping time­ly, rel­e­vant mes­sages to your cus­tomers and prospects. On March 27, 2013 / Business Systems, Digitial Marketing, Email Marketing / Comments Off on Embrace the Drips!